Southie gets a whole lot of love this time of year as home to one of the oldest and largest St. Patrick’s Day parades in the country. But, of course, all of Boston celebrates big on St. Paddy’s Day. And this year, March 17 falls on a Friday, which can only mean one thing: a festive long weekend of shamrock tattoos, green-dyed hair, and Guinness, culminating with the parade of all parades in South Boston on Sunday. Here’s where to celebrate St. Patrick’s Day in Boston, from tracing your Irish roots, to honoring baseball’s oldest park, to raising a pint. Irish Heritage Trail. Join a guided tour, organized by the Boston Irish Tourism Association, to learn about Boston’s rich Irish heritage. Led by Ted Kulik, the tour kicks off at the Visitor Information Center on Boston Common and makes its way to the Faneuil Hall area, covering 10 landmarks like the Boston Irish Famine Memorial. Tours are held on the 17th and 18th, and the cost is $15 adults, $12 students, seniors, military, and free kids 12 and under. Massachusetts Archives & Commonwealth Museum. Ye want to trace your Irish ancestry? Visit the Massachusetts Archives on Columbia Point in the Dorchester neighborhood of Boston. Passenger lists for the Port of Boston are one valuable resource here; you can inquire about family research at the reference desk in the Archives lobby. Complement your visit with a stop at the Commonwealth Museum, which shares the same building as the Archives. View the “Massachusetts Experiment in Democracy: 1620-Today” exhibit — with a “Tracing our Roots” sub-theme — which tells the story of four families of Native American, English, African-American, and Irish heritage. The exhibit depicts the story of an Irish family that includes John Ryan, who served in the 28th Regiment during the Civil War and later became a captain of the Newton Police Department, says Stephen Kenney, museum director. There are more Irish pubs in Boston than there are Murphys. Here are just some of the best spots for a traditional Irish breakfast, a classic corned beef dinner, live music, and a pint of Guinness. The historic Sunday parade kicks off in South Boston at the Broadway T Station and ends at Old Colony Avenue. The best viewing will be along Broadway. www.southbostonparade.org. 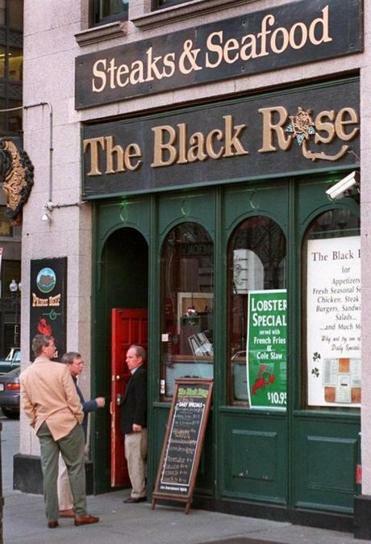 Here are some Irish pubs and taverns in Southie to celebrate the day. L Street Tavern. The motto at Southie’s celebrity corner tavern is Good Times, Good Friends, Good Will — the latter, a nod to “Good Will Hunting,” which was filmed on-location here. 617-268-4335.